"There are a lot of things you need to know to avoid getting ‘taken’ on your next vacation. From must-see apps to common mistakes that make jet-lag worse, find out what you need to know." "Another mistake that can cause vacation turbulence is jet lag. But you say there's an app for that." There's a great service called StopJetLag.com." "This All-Natural Cure for Jet Lag May Be the Best Thing Ever"
Jet lag is very much the worst part of a long-haul flight. But it seems Linda Wells, beauty editor-at-large of New York Magazine, has put her support behind one potential cure, and after hearing about it, it practically sounds too good to be true. 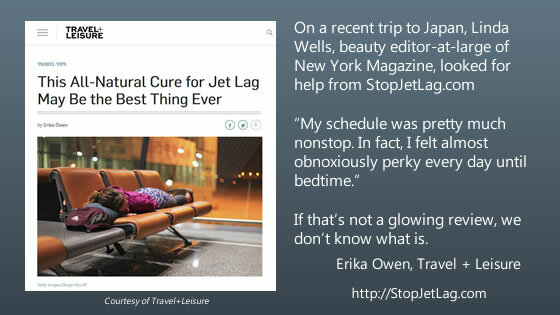 On a recent trip to Japan, she looked for help from StopJetLag.com —a service focused on providing travelers with custom plans including what to eat and drink, when to eat, when to sleep, when to put yourself in front of some bright light, and when to take melatonin (optional). Each plan is based off flight length and destination. "I nodded off in the airport lounge and fell asleep immediately after takeoff. I dozed a good eight hours, switched my watch 13 hours ahead to Japan time, and ate nothing on the plane until hour ten. When I arrived at my hotel around 5 p.m., I took a shower and made a reservation at a sushi bar for 8:30 p.m. Back at the hotel at 11, I popped a melatonin pill and slept until 6:30 a.m., which is more sleep than I get at home. My schedule was pretty much nonstop from then on, and I didn’t drool or pass out once. In fact, I felt almost obnoxiously perky every day until bedtime." If that's not a glowing review, we don't know what is. "Finally, an All-Natural Solution to Jet Lag That Actually Works"
Stop Jet Lag calculates a schedule of meals, caffeine, light exposure, sleep, and melatonin supplements based on your flight time and destination. "For me, that meant a high-protein breakfast and lunch the day before my departure, and then no caffeine and light meals on the morning of my flight," writes Wells. "I nodded off in the airport lounge and fell asleep immediately after takeoff. I dozed a good eight hours, switched my watch 13 hours ahead to Japan time, and ate nothing on the plane until hour ten. When I arrived at my hotel around 5 p.m., I took a shower and made a reservation at a sushi bar for 8:30 p.m. Back at the hotel at 11, I popped a melatonin pill and slept until 6:30 a.m., which is more sleep than I get at home. My schedule was pretty much nonstop from then on, and I didn’t drool or pass out once. In fact, I felt almost obnoxiously perky every day until bedtime." "On the return trip I was able to sleep eight hours on the plane, following my Stop Jet Lag plan, and had no food until breakfast on New York time. I resisted the urge for a welcome-home soy latte — the first day back is a no-caffeine day — and a long afternoon nap. And even though I was groggy and a little stupid for a few days, I managed to stay awake until 11 every night. It was practically a miracle." "Don't leave for the airport without these tips and tricks for a stress-free flying experience. Endless security lines, jet lag, and middle seats don't have to be necessary evils of flying—not if you follow T+L's best tips for smoother air travel. The trick is to get on the right schedule while in transit. Sign up for a personalized plan with the website Stopjetlag, which will give you an hour-by-hour schedule for meals, rest time, and even sunlight exposure, based on your travel itinerary"
REAL SIMPLE -- "Jettison jet lag with StopJetLag.com"
"Whatever your final destination may be, here's what you can do before you board the plane to make that trip more seamless. SYNC UP WITH THE TIME ZONE. Jettison jet lag by following the personalized schedule for your itinerary at StopJetLag.com. You'll get an hour-by-hour plan that includes when to eat, rest, exercise, and get sun exposure so you'll be right in step with your destination's local time." ABC News - Travel -- "Jet Lag Can Be Avoided Naturally"
"Bill Ashton, founder of the Palo Alto, Calif.-based company Stop Jet Lag, developed software that creates tailor-made plans for travelers, taking into consideration their flight times and destinations. Stop Jet Lag provides a personal profile that suggests when to sleep, avoid or seek bright light and even what to eat." United Airlines Hemispheres In-Flight Magazine -- "Beating Jet Lag"
"The best approach is a blend of several strategies. The Stop Jet Lag Plan combines light therapy, melatonin, diet, and other treatments in a customized schedule for each traveler." Two of the highest ratings went to treatments that are incorporated in Stop Jet Lag. Correctly timed Bright Light Switching rated 3-1/2 stars (closest to a cure). Correctly timed Melatonin Supplements rated 3 stars (viable treatment). "For many travelers, the real turbulence begins after a flight. Crossing time zones disrupts your body clock and can lead to sleepy days, sleepless nights, and malaise. But scientists are learning why plane travel throws your body into a tailspin and how to prevent jet lag. Here’s how. The Stop Jet Lag personalized plan. Using information about you and your flight schedule, Stop Jet Lag tailors instructions so you can time light exposure and melatonin intake. Included are tips for a schedule and meals. Experts consider it promising. As scientists learn more about the body clock, they hope to publish research that will let you look up a trip and get directions to avoid jet lag. Meanwhile, Stop Jet Lag does something similar for a $45 fee." "On my arrival day in London, I functioned almost normally, working and talking to people. The next morning, I awoke at 8:30 AM, completely rested. For the rest of my 12-day trip to England and Scotland, I felt no symptoms of jet lag whatsoever. It was as though I had always lived on Greenwich Mean Time. "I think it's a stunning development... A remarkable new approach for overcoming jet lag when you travel by using a computer to map out your daily routines." "Bruce Fritch, president of Fritch Consulting, has used Stop Jet Lag many times, including when he had to conduct two group meetings and five one-on-one interviews after traveling 32 hours from India to North Carolina." He says, "If it hadn't been for the Stop Jet Lag system, there's no way I could have done it."